Sometimes patterned shirts with contrasting white collars. The wider the collar the better to show off the hairy chest and medallion. Collars that were wider than your shoulders were really impressive. Now they’re back in fashion according to Harry Hill! Believe it or not, it seems that this shirt actually has its roots way back in the medieval times and later evolved into the Elizabethan ruff… (and everybody loves a bit of ruff! ).Back in the 70s, we thought it was such a new fashion, but being the 70s we had to put our own tasteless spin on it! The shirts could be patterned or as multi-coloured as possible, or just a plain colour, such as black or brown. 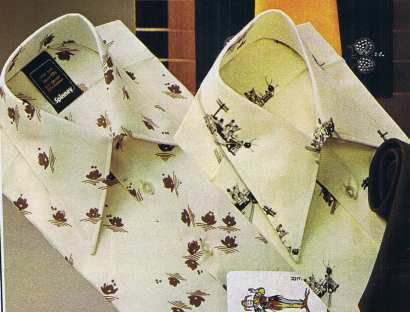 Sometimes the collar matched the pattern of the shirt but the plain dark shirts often had white collars to make them stand out and look even bigger. As you danced on the disco floor, your collars almost took off. Those collars were like large elephant ears coming across your body. The ones I liked the most were the wide collars that also had a sort of metal end to them, similar to a cowboy shirt. No need to feel embarrassed now about those old photos , because then strolling along wearing your fashionable shirt with those huge wide collars in your billowing flares and platform soles, really meant that you belonged to the greatest fashion era there has ever been! Just look at the likes of the radio one djs such as Noel Edmonds and Tony Blackburn. In those days, these guys were really fashionable and you would see them in their shirts with huge collars, maybe showing a bit of bare chest and a hint of a medallion. Alternatively, their big wide collared shirts covered up by a colourful tank top with just the collars on show.